New BIOS mod (unlock G1) / Hardware / DC-SWAT - Сайт о Sega Dreamcast и не только. The new BIOS mod, will switch to original BIOS immediately after loading DreamShell core to RAM from custom BIOS, but before execute it. After as BIOS is auto switched, DreamShell will be executed from RAM. So you can get maximum compability as on original BIOS and working HDD/GD without problems. But need updated BIOS firmware with DS core (ds_core_pic12f675.bios), you can get it from GitHub or forum. What is the difference between New BIOS mod and the old BIOS mod? You said that «you CAN Get Maximum compability » then it means this New BIOS mod would allow to execute more game successfully than old Bios mod in Dreamshell iso? And what does mean of GPIO 0 5 6 7 on your screenshot? 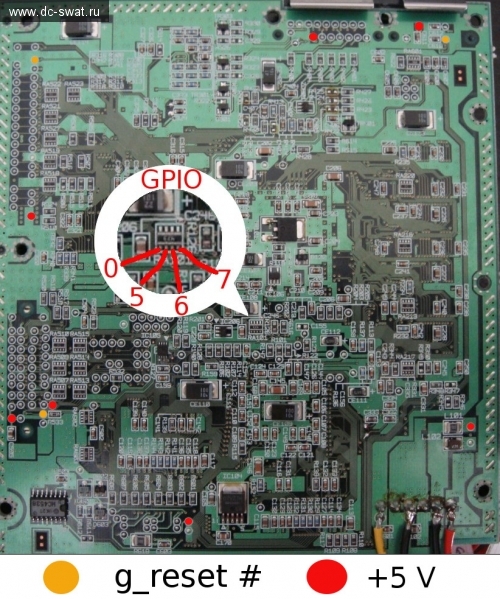 IS GPIO not the same with pic12f675's pinout like below link and GPIO means specific pinout? and Can I use any type of diode regardless of specification for this New BIOS MOD? (for example Can I use Current Regulator Diodes 1N5310 or 1N4148 (100V)or 1N4001,1N4004 for this BIOS MOD? with latest bootloader BIOS and DS_CORE.BIN from GitHub. Thanks SWAT very much for your reply. Is there any crucial difference between «just wiring IDE interface» and stick «G1-ATA(IDE) adapter» into slot from GD-ROM? Does stick G1-ATA(IDE) adapter into GD-ROM's slot" has superior compatibility than «just wiring IDE interface/cable to DC mainboard» for running GDI or ISO image files in Dreamshell ISO? And Should I try any Bios mod in order to run GDI or ISO image from IDE 40 pin's HDD? For your information I have a dreamcast which is marked as «IC BD KATANA MAIN V1 Made in Japan» and it has still working GD-rom. BIOS mod is not required, you can launch boot loader or DS core from CD and put other DS resources to HDD. Thanks SWAT very much again for your reply which always got to the point and to the heart of the matter. YOU ARE THE KING in the Dreamcast Hacking Scene!